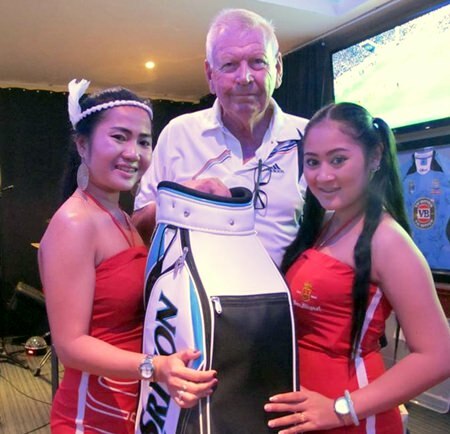 153 players, including 14 ladies, made the short journey to the Phoenix Gold Golf Club on Feb 24, where they played the Ocean & Mountain combination in the latest Pattaya Amateur Golf Series (PAGS) monthly event. Although the weather was warm, there was a steady breeze to keep it from being too oppressive, although a heavy shower at around 2:00pm, which lasted for about 3 holes, put a bit of a dampener on some rounds. We played from the white tee markers, with some being well forward, but still the course was the same challenge for all. Darren Ottaway (centre) – Low Gross & A Flight winner. As with most months there is at least one, and sometimes several outstanding performances at this event. Special mentions for this latest tournament should go to Darren Ottaway (H/cap 1) who shot a round of 70 to win the Low Gross, while Arne Wirbo (23) had the day’s best stableford score of 42. Both got the top spot in their relevant flights, with Darren having 39 points to get the win on a count back over Jeff Wylie (8) in second and Bob Watson (5) in third. The C flight of handicaps 20+ had all placegetters hitting the 40 points mark. Arne led the way home by a clear 2 points, with Leif Halen (23) and Tomas Sandel (21) needing a count back to decide the minor placings after both signed for 40 points; Leif getting the nod 7/5 on the final 3 holes before they could be separated. Jon Thowsen (centre) – B Flight winner. The B flight, for handicaps 14-19, was tightly contested, with all placegetters separated by only 1 point. Jon Thowsen (18) was the clear winner on 39 points, while second and third, Kevin Johnson (16) and Ian Walsh (17), both recorded 38 points and the count back being decided on the last 6 holes 14/13. The ladies kept up the tight decisions for the day and while Kalong (22) was the clear winner on the day, with 41 points to go with her near pin prize, Chop (13) only just beat Nantaporn 19/16 on count back after both finished with a creditable 40 points each, both picking up technical prizes also. Special mentions go out to multiple winners in the technical prizes, getting their maximum 2 prizes. Among them were Jerry Sweetnam, Nantaporn, Nicolas Jenkins & Jeff Wylie. Arne Wirbo (centre) – C Flight winner. Dave was at it again, who with his capable staff on the BBQ, kept all attendees well satisfied with their tasty offerings for the night. 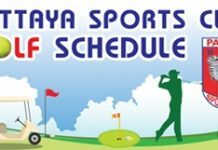 We will all look forward to another successful tournament scheduled for 30th March, again at Phoenix, so get your preferred timeslot by booking with Shane on 086 372 0084.